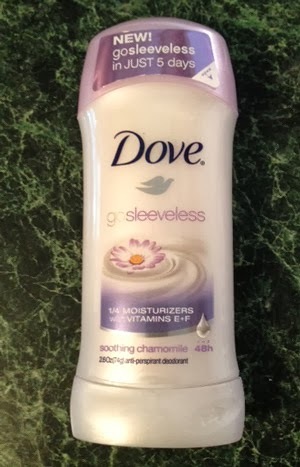 THE SKINNY: Dove's Go Sleeveless Deodorant was part of the Total Beauty What a Girl Needs Mystery Collection box (check out the full review) and is a great drugstore product. As a fan of Dove for years, it's always great to try something new. And this product did not disappoint. The product went on smooth and the "Soothing Chamomile" fragrance was light and not overpowering. What's great about Dove is that it never seems to dry my skin out. I will admit to switching between a variety of deodorant/antiperspirant products and always come back to the brand when my skin gets in a rut. It also helps shield against some irritation from shaving, helping it live up to the "Go Sleeveless" name. While Dove does claim that this product will not rub off on clothes, it does happen with super dark colors. So be careful to avoid those unattractive white marks! CHECK IT OUT: You can find this product as drugstores, grocery stores and discount retailers. DISCLOSURE: Total Beauty provided a sample box for review.